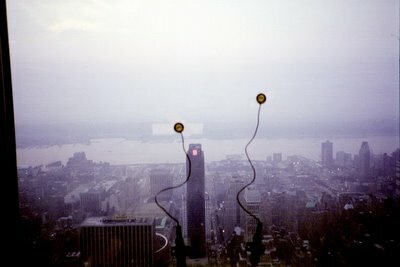 In 1999, New York-based sound artist Stephen Vitiello was awarded a five-month studio residency on the 91st floor of the World Trade Center. For his project World Trade Center Recordings: Winds After Hurricane Floyd, he taped contact mics to the studio windows, "picking up the sounds outside of passing planes, helicopters, storm clouds and traffic, the building itself swaying in the wind." But this reminds me of two other, related projects: 1) I read a review once in The Wire about a guy who taped contact mics to his window to record the sound of snowflakes hitting the glass – a recording which was then released on CD. Unfortunately, I can't find any information about this at all. 2) Extensive seismic readings were taken by Columbia University during the World Trade Center attacks of September 11th – the Precambrian bedrock of Manhattan was rumbling as the two towers collapsed, and this showed up on Columbia's seismometers. Sound artist Mark Bain then transformed this information into audio files, so you can actually listen to the wounded, melancholic howl of Manhattan as its two tallest buildings fall to the ground. Ultimately, Bain produced "a 74-minute recording of the ground vibrations of the World Trade Centre's collapse and contiguous mayhem," The Guardian writes. "It certainly does not make easy listening. The piece begins with a low, disconcerting rumble and proceeds through a range of fluctuating sounds. Bain says the vibration of the towers as they were hit by the hijacked passenger planes sounds like 'tuning forks'." He then seems quick to add that he "sees nothing morally questionable in making an artwork out of the event." "I guess I'm the black sheep," he says, "the anti-architect." Wasent't it John Hudak ? I have a piece from called 'snow' (Mp3 only ?). By the way (=> your post about singing bridges) do you know John's work about Brooklyn Bridge (1998 - Brooklyn Bridge - CD) ? I (toy.bizarre) also did a full year audio stream from my window around 2001-2002 (Check kaon website) including periods of "sound of snowflakes hitting the glass". There are some pieces composed with that, but still unreleased at the moment. Have you been to Ubu.com? They have a 7 minute excerpt of Vitiello's WTC peice, plus many more by him. Not to mention scads and scads of work by other historic and contemporary sound artists. It's an essential website. Peter, what does the Minnesota seismic/music transformer actually do? Can it transform seismic data in real time into a musical composition? In other words, can you "listen" to the California fault systems? Every little stress and movement. I'm not advocating or confirming that observation, mind you, simply putting it in the context of audio art, and the use of seismic information to generate "music." In any case, I've written about that book in an older post: Earthquake Body Radio. Would love to hear that thing you've got in Minnesota, meanwhile. And Francisco Lopez really interests me - he has a quote I love, from when he was field-recording Costa Rican rain forests, something like: what you call the sound of the wind is actually the sound of branches and leaves. Anyway, he's an interesting guy. As far as John Hudak goes, I can't yet find any specific info on the snow piece - but if someone out there has an old issue of The Wire from ca. Jan/Feb 2002, it was reviewed in that somewhere, maybe toward the beginning of the issue if I remember. But maybe it was Hudak; I'll keep looking. And I'll check out your links, too, ingeos. Finally, Joseph, I do know Ubu but don't utilize it nearly enough. Thanks for the reminder! As you may have noticed, I just updated this entry to incorporate Mark Bain and some other info. Thanks for everybody's input! Rather than creating a piece of music, the notes appear to be random, in the way that wind chimes are random. The notes vary in intensity. Some are soft and others loud -- relating to the intesity of the seismic activity. Before the museum opened, I happened to be around when the installation was being tested. Someone had connected a keyboard and was playing music. I'd love to hear that again. The Hudak snow piece was on Tiln - seems to be "404" now..